It is difficult to stay in line when dealing with historic houses, structures, music, etc. To program anything constructed, thought of, or built as long ago as yesterday seems to be an impossible task. There are always preservationists, environmentalists, moralists—somebody who steps in to protect what is there. Not so with Kimberli Meyer, director of the MAK Center, and Fritz Haeg, who was the co-impresario of Showdown, a fashion show that programmed the Schindler House to parallel the real fashion shows happening around the same time. It wasn’t an anti-show, nor was it alternative. It was what it was: out of line. 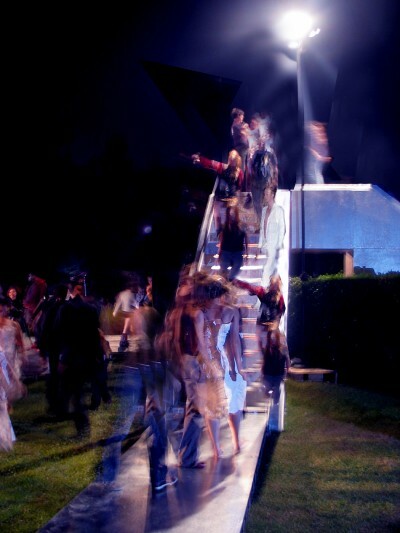 With models in sunken pits, runways wrapping over fences, and once separated outdoor gardens forming a unified interior, the house itself became the dressing rooms, DJ booth, and all else that’s needed for a full-on runway show, with 500 or so people on the premises. In fact, it wasn’t just one show: multiple shows were happening at the same time, just as we experience what we wear in unique and simultaneous ways. It’s a thin layer, the fabric and construction of a garment. It provides a direct relationship between the interiority and exteriority of our bodies. Showdown was a reminder that clothing surrounds our bodies and is the first level of architecture. Models popped up on the towers east and west of 835 North Kings Road. The applause seemed unrelated to and uncoordinated with what one experienced face on. Unrelated, like the many questions the programming of the Schindler House asks, and it asks questions ALL THE TIME. It rarely behaves. Nor is there a theme, the death star of museums of any size or form. It certainly doesn’t try to be interesting—but rather, interested. 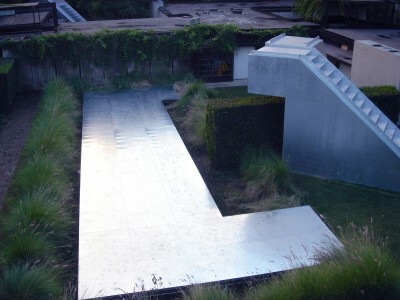 Most importantly, knowing the Schindler House first as an architect-in-residence and having tried not to miss too many exhibitions there over the past ten years, one thing is clear: it’s not just architecture that makes the place—as unique and illuminating as it may be in Schindler’s case—it is the people who run it. It is the ones who put their jobs on the line, because they have a vision: stay out of line, and on point. Christoph a. Kumpusch is a New York-based architect.